The holidays are a wonderful time of the year – they are a time to eat, drink and be merry! If you are like most people, you likely overindulged in fatty foods, treats and alcohol over the past few weeks, which has probably left your body feeling off balance and less than stellar, and maybe your pants are fitting a bit snugger now. Now that your guests are gone and the party’s over, it’s time to get back to work and start feeling normal again! Why not try Pascoe’s Detox Kit? Selecting the right detox can be confusing, as there are MANY different kinds of detox products out on the market. Detox kits come in all different strengths, and generally the stronger the detox, the more likely you are to experience side effects. To select the right detox for you, you should always do your research before choosing a program. If you are unsure about what is right for you, you can also consult a medical or healthcare practitioner for advice. But the most important thing with any detox is to try to incorporate the program into your life even after you are done. You may be feeling more bloated and unbalanced due to the holidays, however, toxins come in many forms in our daily lives – not just in the food we eat. We are exposed to toxins on a regular basis from the air we breathe to the chemicals we put on our bodies, to the food we eat. Toxins can range from anything to pesticides or chemicals used on foods for freshness, preservatives added to foods, chemicals found in cleaning or household products, gas, antibiotics found in meat, pharmaceuticals, additives in vaccines and beauty and healthcare products and many more. Detoxification is something that our bodies do naturally on their own, and quite effectively! That’s why we remain generally healthy even when we are exposed to this constant stream of toxins daily. The problem arises when our organ systems get overloaded with toxins and can no longer function efficiently enough to get rid of all the toxins we are exposed. This causes toxins to build up in our cells, tissues and organs and can result in symptoms of dysfunction or disease. When toxins build up it makes it much harder for our bodies to maintain health. 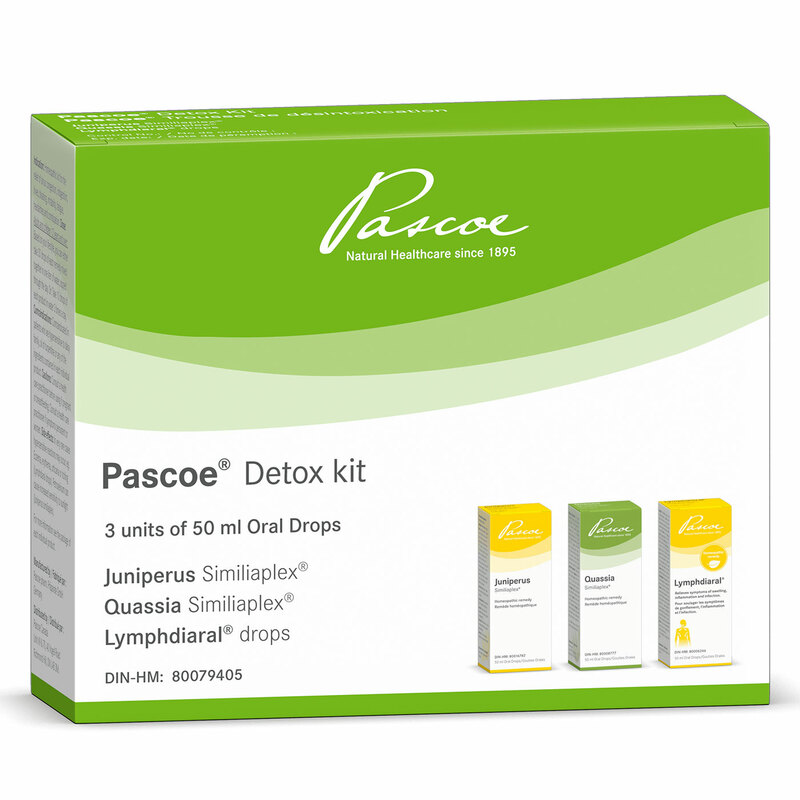 The Pascoe Detox Kit is a gentle yet effective detoxification system that supports and optimizes the body’s ability to shed all the harmful and potentially harmful toxins that build up over time. It lasts for about 4-5 weeks and includes Lymphdiaral, Quassia Similiaplex, and Juniperus Similiaplex drops. The Kit is homeopathic for the relief of sinus congestion, indigestion, hives, bloating, irritability, fatigue, headaches, and constipation. Pascoe’s Detox Kit is mainly made from plant-based naturally sourced medicinal ingredients that aid in the detoxification process. Although the benefits of detoxification are wonderful and can make you feel amazing, the process of eliminating toxins can be a difficult process. Short-term one can feel worse during detox, but the long-term goal is that removing these toxins for goodwill improve overall health. Therefore, it’s important to nourish the body as well as possible during detoxification. Whole foods including fruits, vegetables, whole grains, goods fats such as nuts/seeds, olive oil, avocados and lean proteins are all extremely important during the time. A glass of lemon water in the morning can get the liver moving. In addition, many vegetables, especially cruciferous vegetables contain compounds that help to optimize liver function and may be beneficial to be eaten daily during a detox. These diet changes can also help support our digestion as a whole. Whole, organic foods especially vegetables contain fewer chemicals, pesticides and preservatives which can be harmful in large doses contributing to the overall toxic levels in the body. Decreasing the level of chemicals in the food entering our stomach makes it easier for our digestion to function and for our digestive system to excrete toxins instead of absorbing them. While not the primary organs of detoxification digestion and intestinal health are important members of overall well-being and optimal toxin reduction. A detox diet is an incredibly important part of overall detoxification treatment. Try the Pascoe Detox Kit today and get your body and mind back to a more balanced and normal state!